Turn key, self contained water system that is universal robust and at our low price high quality standards. - Beautiful blue LED lights to illuminate water - hidden under scupper. - Auto fill system- automatically adds water when needed; Low level sensor protects pump if water supply issue. - Filtration- water is conditioned with a reusable, easy-to-clean filter. - Leveling / Height Setting- four heavy, 3/4” threaded feet give flexibility of height adjustment and leveling. Easily adjusted on site with ~4” of travel. - Overflow feature allows water to escape safely. - Electrical Connection- simply with a 5-lead, 20’ cable ready to connect. Control Panel incorporates 3 push-to-reset breakers for water, LEDs & fire. 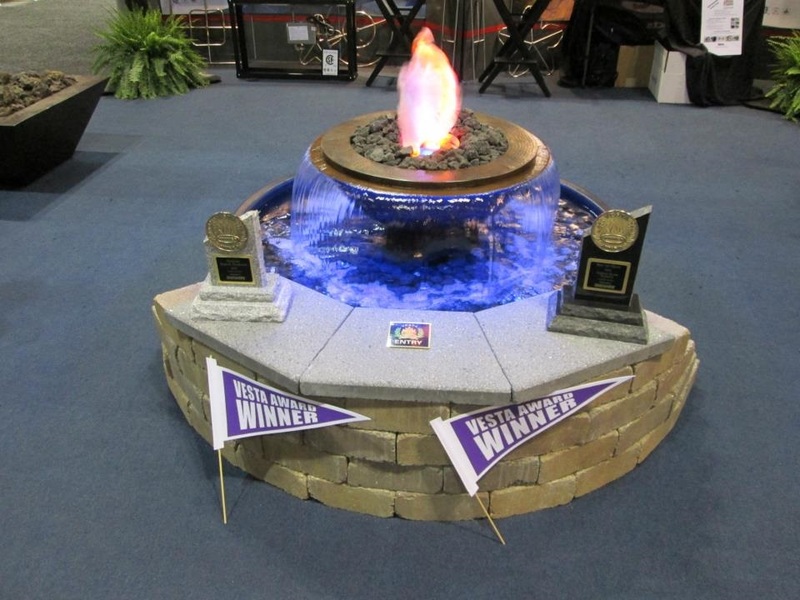 - Fire Pit Insert: CSA Certified Remote Electronic Ignition 13SS90HWI 90k Btu, 12” burner. - Copper Bowls: Choose from a 4-scupper design or the new 360-degree model- both handmade with beautiful hammered copper.